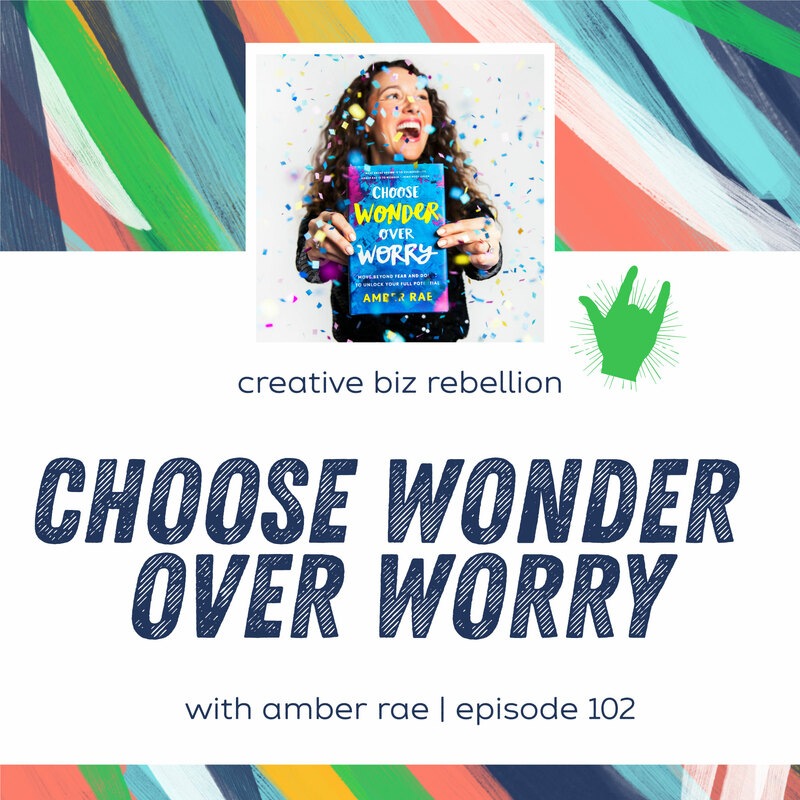 After we read Amber Rae‘s book “Choose Wonder Over Worry”, we had to have her on the podcast! On today’s episode, we chat with Amber about worry and how that relates to our creative lives. If you have ever had a doubt or fear to work through, this episode is for you! Called “A Millennial Motivator” by Fortune and “The Brené Brown of Wonder” by Mind Body Green, Amber Rae is an author and artist that advocates for creativity, personal growth, and emotional wellness. Her book, “Choose Wonder Over Worry: Move Beyond Fear and Doubt to Unlock Your Full Potential” (Macmillan) is a guide to navigate life’s challenges—projects that fail, imposter syndrome, feeling envious or anxious or stuck—all of those, “Am I good enough? Who am I to do this? What if I fail?” moments. Her writing and speaking blends raw and relatable stories with actionable aha! moments, and has reached over 5MM people in 195 countries. She’s motivated audience at companies like Kate Spade, Lululemon, and charity: water to create beyond fear, and she’s advised leaders at companies like Adobe, IDEO, Google, Facebook, and Apple. As an artist, she uses art as a vehicle to normalize emotions and help us feel less alone. She’s created interactive and public art exhibitions in twenty countries across the globe. Formerly, as Seth Godin’s “Chief Evangelist,” she helped him launch six best-selling books, and worked with brands like Apple, Dove, and Kimberly-Clarke on their global marketing campaigns. Her work has been featured in The New York Times, NY Mag, ABC World News, Forbes, TIME, Fast Company, Fortune, Inc., BBC, Mind Body Green, and Tim Ferriss’s blog. She lives in Brooklyn, New York (and around the world) with her fiancé, Farhad. Have you joined our Facebook group yet? We’ve worked hard to create an awesome space for Product Based Biz Owners who are ready to rock! We don’t bite so come join us! Want to dive deeper? Head to creativerebelbase.com for workshops and much more! If you have a second please jump over to iTunes and leave us a review! Click on the link and then click on “view in iTunes” to leave us a review. We give you all the virtual fist bumps. Thank you! Throwback - Episode 12 - Discounts, Black Friday, & Cyber Monday Oh My!